So how many liveries is that now? 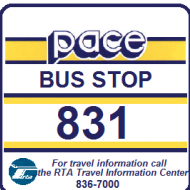 We have Rock Island, Milwaukee Road, Illinois Surfliner, New Metra & Old Metra. Am I missing any? We need CNWand BN, Norfolk and Southern, and Illinois Central Gulf. Actually surprised there hasn't been a BNSF-liveried locomotive yet, seeing as its the highest performing line. Unlike the Rock and Milwaukee Road, BNSF is still in business and owns its trade dress, as well as numerous locomotives. It would have to give permission, and for the last reason I noted, won't. If the purpose is historic, the only appropriate livery would be Burlington. But Metra doesn't own the rights to that, either. 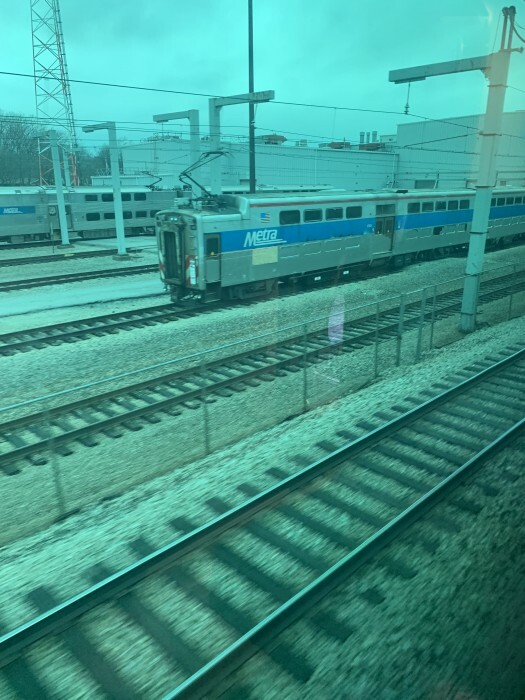 Unless you want to count the Operation Lifesaver locomotive, the only one I can think of is Metra locomotive 100 with the RTA wrap, but that has been removed. CBS News: Train nearly hits police car when warning devices fail in Mokena (includes dash cam video). More details on this incident. It turns out that a previous train experienced a similar near miss and the engineer failed to report it. Video from on board the trains has been released. KYD yard had a 4 or 6 car old high liner train in the yard and on the wire. Does anyone know what the deal is with this especially being active on the wire? 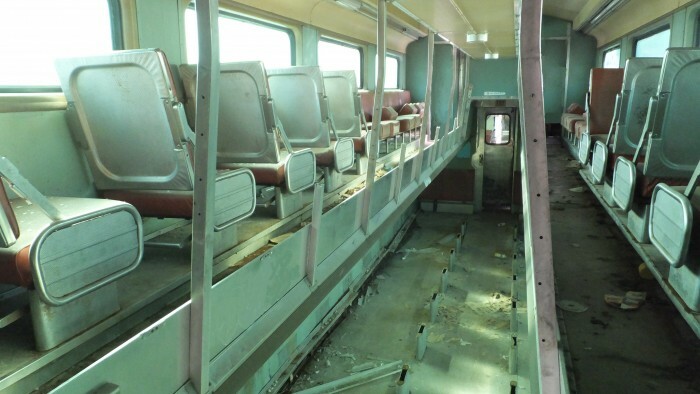 Due to the ongoing equipment shortage, Metra is experimenting with removing the seats in some cars to increase capacity. This will allow some trains to be as short as two cars until newer equipment can be obtained. In the 1960's MILW ran 2 car trains most times except rush, usually a gallery cab, a single-level and an FP7. Early 60's you saw singles too, but they had issues with shunting signals so the minimum became two. Is that first picture the inside of old high liners at KYD? Also how will removing seats increase capacity in a bi level car? From the looks of the picture ill assume that is inside the old KYD as the windows look painted over. Are they going to remove the top portion of the upper deck? If not the only room you have for people is in between the railing.... unless your really short then you can stand under neath the top level. Just curious as to how this will work... It worked great on CTA with the MAXX seating configuration less seats more standing.. but CTA cars were one level no celling restraints. The upper level seats are still in place. There is a $5 surcharge to sit there, which will go toward the purchase of new cars. Last? freight customer on MILW north line is gone as of today - Newly Weds Baking at Healy burned to the ground today and made the national news. KYD stands for Kensington Yard. It is located about 1 mile south of the Kensington station on the ME, starting around 121st to near 127th, west of the mainline tracks. KYD (Kensington Shop) replaced the old Burnside Electric Shop at 95th in 1980's. A couple of Burnside's buildings were repurposed by CSU for lecture halls. Obviously these had been stored somewhere and got graffitied. Any idea why they were brought back to KYD and powered up? I gather there are still maybe a half dozen or so that haven't been disposed of? You might laugh, but there is a serious side to this. 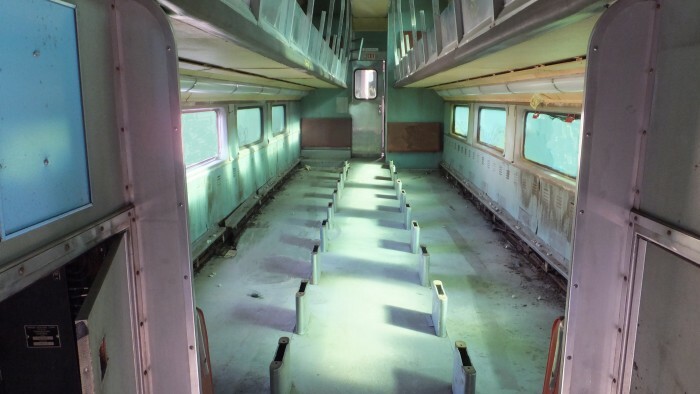 During WW2 there WERE passenger cars with most seats removed for maximum standing capacity to haul workers to war plants, and this is exactly how they would have looked inside. There is, as the modelers say, "a prototype for everything." Yes they were graffiti, I am wondering why they bothered to repaint these. There are some/were some stored on the RI main line siding. 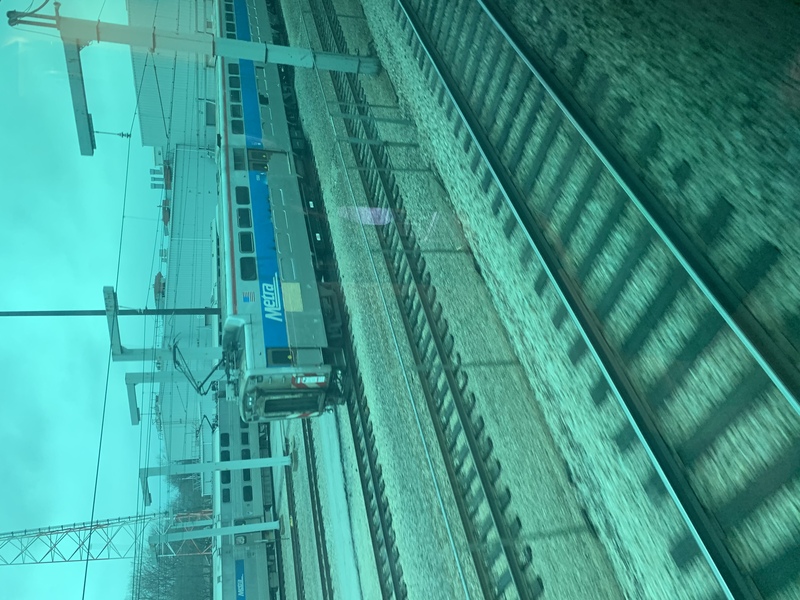 There are also 6-8 stored on the Milwaukee West at Bensenville.